characteristics. When the lesson was over, she asked if anybody wanted to take it home. Nobody volunteered. Not even Tennyson. But he felt sorry for the chameleon, so he raised his hand. He named it Godzilla, put its cage in the kitchen, and anticipated a friendship that would last its projected lifespan of seven years. By all accounts, the entire Swerling family tried very hard to take care of Godzilla. They kept his cage clean, well-ventilated, moist and hot. They gave him leafy plants with lots of vines and branches to climb. And they fed him the recommended diet of crickets and grasshoppers, which Tennyson purchased religiously from a pet store. Nevertheless, the chameleon died in six days. After that, the subject was not discussed, so when Winston showed up many years later, Esther had absolutely no intention of keeping him. He, however, seemed to have ideas of his own. 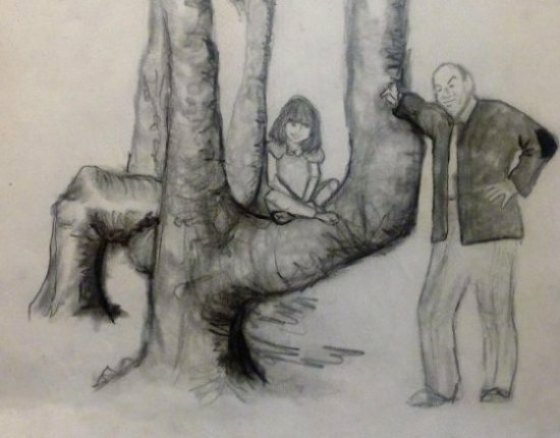 Other than Merritt Jones, who was a human, and myself, a tree, Winston was the only thing in the Samuel Swerling Park that Esther fell in love with. Winston, in fact, made Merritt possible. It was a perfect day in April. Warm, but not hot, with a delicious breeze, a cloudless sky, and no humidity. Irises, hyacinths, anemone, and lily of the valley were all in bloom, and the air was heavy with the scent of wisteria and lilacs. Esther was drunk on spring. She had no purpose, no ambition, no desire, and no energy. She did not attempt to climb any trees. Not even me, and I’m her favorite. If there were Richter scales on that afternoon calibrated to measure will power, hers would have registered zero. All she wanted to do was lounge on a park bench and let her mind bask in the sun. She was, at that time, an elegant twenty-six years old. She did not know that she was beautiful, because her inner tomboy had kept it a solemn secret, and she did not know that she was elegant, because nobody had ever told her that elegance is in the bones. Esther’s body was long, lean, and angular. She had a high forehead, high cheekbones, and a jaw slightly more oval than square. Her features were symmetrical, with naturally arched eyebrows, a wide mouth, and a mysterious smile. She wore her glossy black hair in a long braid that hung halfway down her back. Her eyes were brilliant splinters of violet and sapphire that radiated from her pupils like starbursts. He did not say another word for at least a minute. Esther grimaced and looked worried. I’m not sure if Esther ever did figure it out. Nor did she break any hearts. At least, none that I know of. There was Winston, of course. And for a little while, their relationship was a bit iffy. They met on that lackadaisical June afternoon. Esther had staked out a park bench and looked as if she would never move. Her legs were stretched out in front of her like a slant board, long and slender in her cut-off blue jeans, and she was wearing a skimpy purple top that made her ivory skin glow and her black hair shine like obsidian in the sun. Her arms were spread out along the top of the bench, and her head was tilted back. She could have been sleeping, daydreaming, thinking, or a jumble of all three. First she focused on what was directly in front of her. Without moving her head, she shifted her eyes to her left. To her right. Trees. Flag pole. Street lamp. She tilted her head down. Park bench. Water fountain. Grass. Path. It was small, long, and furry. It looked a little like a squirrel, more like a mink, and even more like a weasel. But it couldn’t be any of those, because it was much too tame. Tame, patient, and curious. And it was standing much too close to her. Closer than any animal in the park had ever stood before. But it did not look feral. Esther was wearing thong sandals, and her toenails were painted red. The creature stood about two inches from her nearly bare feet. What if, she asked herself, it thought that her toes were strawberries? What if it liked strawberries? What if it clamped down on a strawberry-colored toe with its sharp little teeth and never let go? She did not move. She did not twitch. The little animal stood on four short legs with his head tilted up, and it stared unblinkingly into her eyes. It had small circular black eyes, bright, innocent, and unwavering. They mesmerized her. At the same time, they conveyed an unmistakable message. Please what? Esther wondered. What do you want? She studied the creature’s face. It seemed likeable enough: Wistful, with a button black nose, white muzzle, and white whiskers. She studied its body. Black fur all over, except for the ears, which jutted off the top of its head like small pink seashells. Rounder, though. And pinker. And cuter. It was a guileless looking animal, and appeared to be absolutely trusting and absolutely fearless. It took one step forward; then another, until its front paws rested on the toes of Esther’s right foot. The paws were soft, feathery, and as gentle as fat flakes of new fallen snow. The creature’s eyes held steadily onto Esther’s eyes. It took another step forward. Its belly now rested on Esther’s toes, and its chin balanced on her instep. She felt as if a warm, soft towel had been draped over her foot. The creature was still looking directly into her eyes. Slowly, slowly, she raised her leg. With a quick jerk, she kicked the animal off her foot and sent it flying across the path. It landed six feet away. Esther leaped up, horrified by what she had done. She rushed to where it lay and reached down. It was a boneless puddle of fur. For a few long seconds, it did not move. And it started to lick her hand. Its tongue was soft. Gentle. Sweet. Just then, a teenager strode up the path to where she was kneeling, and he knelt down, too. Esther looked at him blankly. With a big hand, the teen grabbed the ferret behind its head, curled his fingers under its front armpits, and lifted it the way a fisherman might lift a prize catch. He held it out and let the rest of the ferret’s body dangle like a limp sock. 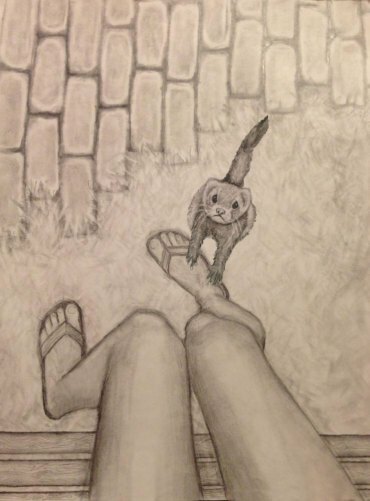 Still hanging limply from the boy’s hand, the ferret turned his head toward Esther. The boy had clearly taken a liking to him, but he, the ferret, just as clearly, remained true to his first love. Winston Churchill’s morale-boosting speech during World War II to, “Never give in. Never give in. Never, never, never, never – in nothing, great or small, large or petty." The ferret she was holding in her arms had latched his eyes on hers and decided that he wanted to belong to Esther. The ferret persisted in its objective. The little guy never gave up. So Esther named her ferret Winston after the unwavering Prime Minister, profusely apologized to him for her blind obstinacy, and with an odd little smile – the kind of a smile that often steals onto the face of first-time pet owners – she carried Winton home.